Guest Bill Palmer is an A330 captain for a major international airline, and author of “Understanding Air France 447,” available in paperback and as an eBook. Bill was a member the A330 development team introducing the airplane to his airline’s fleet, and was lead author and editor for the airline’s A330 systems manual. He’s also written many A330 training publications, served as an airplane and simulator instructor, check airman, and designated examiner. 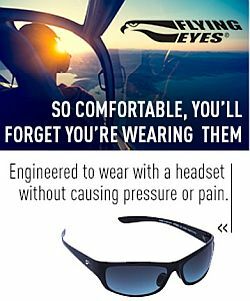 Bill is an Embry-Riddle Aeronautical University graduate, holds a BS in Aeronautical Science, and an ATP with type ratings in A320, A330, B757/767, B777, DC10, and commercial glider and flight engineer-turbojet ratings. We talk about the facts of the Air France 447 accident, including the events in the cockpit, the difficulty locating the flight recorders, and the messages sent from the maintenance computer. Bill describes “automation addiction,” a tired flight crew, and the “startle factor” at play here. We talk about high altitude stall training, practice with the flight director automation turned off, and of course lessons learned and changes that resulted from the investigation. You can get Understanding Air France 447 in paperback or as an eBook through Amazon.com, Barnes & Noble, the Apple bookstore, and at the book’s companion website: UnderstandingAF447.com. Bill’s personal blog is Trend Vector and you can follow him on Twitter as @wfpalmer. Photo credit: Air France A330-200 F-GZCP lands at Paris-Charles de Gaulle Airport by Pawel Kierzkowski. 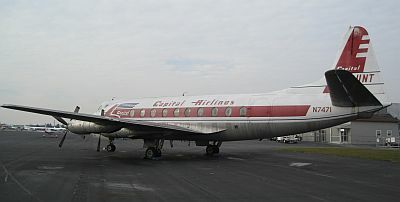 David Vanderhoof’s Aircraft of the Week: The Vickers Viscount, reported by listener Ray Williams. 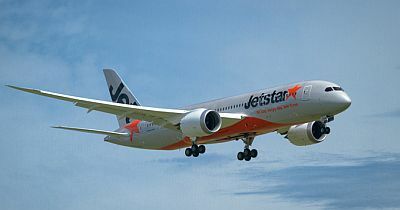 Steve and Grant were on hand at Melbourne International Airport for this report as Jetstar’s first Boeing 787-8 Dreamliner, VH-VKA (c/n 36227), arrived at the end of her delivery flight from the USA. Although not the first Dreamliner to operate commercially in Australia (that honour went to Air India), VKA is the first of type on the Australian civil aircraft register and the first of 14 being delivered to Jetstar over the next two years. Qantas will also be taking delivery of 787-9 aircraft in coming years. The aircraft touched down smoothly on runway 34, despite very high winds, and was welcomed with a traditional water cannon salute before making its way to the Qantas Maintenance Centre for a more formal ceremony with Qantas and Jetstar management, local and federal politicians, and a large group of staff in attendance. In this report, we speak to Jetstar Australia/New Zealand CEO David Hall about his vision for the this new aircraft type, and the process the airline went through to have it certified for Australian commercial use. Coverage on PCDU Facebook page, including video & Grant’s radio interview. 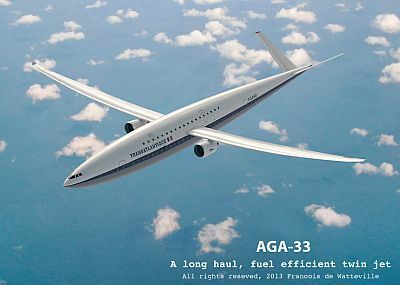 Pieter Johnson talks to Francois De Watteville, a design engineer who created the AGA-33 and presented it to the Paris Air Show. Francois is not an aircraft designer but turned his hand to aircraft design for the purposes of creating an airliner after travelling regularly across the Atlantic, that was efficient. Find out why and how you may be able to help prove the concept. This entry was posted in Episodes and tagged AF447, Air France, Airline Fees, B787, Book, China, Jetstar, Mooney, United Airlines on October 16, 2013 by maxflight.